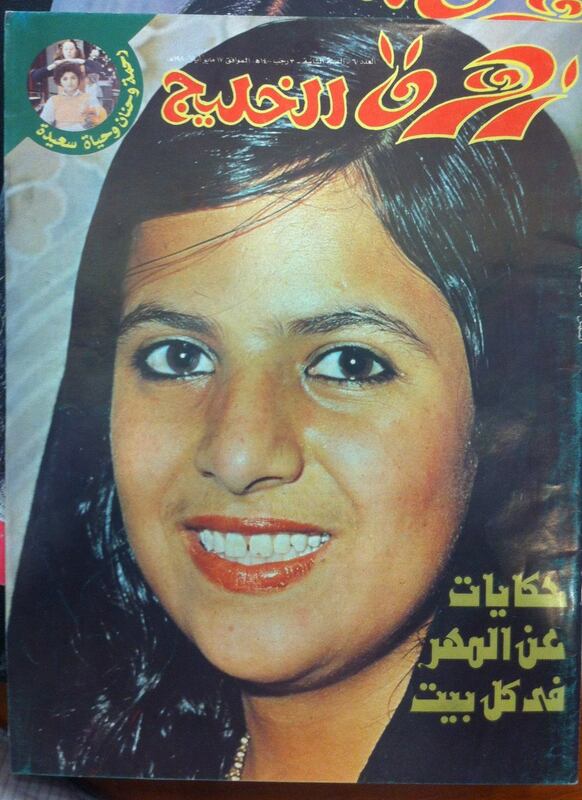 Going through the small but well-kept collection of old magazines at the National Centre of Documentation and Research, I was excited to come across a stack of old Zahrat Al Khaleej ("Gulf Flower") magazines. Founded in 1979, it was the UAE's first widely distributed women's title. What strikes me as interesting about these covers is that, 33 years ago, ordinary girls from the UAE and other Gulf countries were happy to be photographed without covering their hair. Today, the vast majority of UAE nationals wear traditional dress and one would be hard pressed to find a Khaleeji (Gulf Arab) woman to do a magazine photo shoot without full abaya and shayla. I recently interviewed the founding editor of Zahrat Al Khaleej, Abla Al Nowais, and was impressed by stories of her time as one of the first female journalists in the UAE in 1969, as well as by her outspokenness on the development of women's rights since then. When I started in media, women were more ambitious. My generation expected more from the new generation. Now things are easier for women, so we need to see something better. Sheikh Zayed had a vision and he believed in women. He believed they could manage everything. They gave them all the chances, but only few took the chance. The problem is not from the government; it is from the women, from society. Nowadays many of Zahrat Al Khaleej's covers feature Arab celebrities, who not only wear no veil, but pose and pout seductively for the camera. It is a far cry from the magazine's activist roots, when Zahrat Al Khaleej was intent on transforming the role of women in a deeply conservative society. Supported by Sheikh Zayed's progressive views and the patronage of his wife, Sheikha Fatima, the magazine had royal license to break social taboos and establish a new, modern image of womanhood in the UAE. It was a revolution for the female population. We encouraged girls to go to schools and launched small schools outside of Abu Dhabi city, in the desert villages. Looking through old media reports from the 1960s and 1970s, it is remarkable how much more conservative fashion in the UAE and the entire GCC region has become since then. Today, most regular Emirati women cover hair and body, sometimes the face and, less commonly, also the hands. Back then, many wore Western clothes and much fewer young women chose to veil. Apart from the changing tides of social norms, these magazine covers are also a window onto what were considered important women's issues at the time: dowries and embroidery on the one hand; women's entry into male-dominated professions such as aviation and fishing, on the other. Education is an overarching theme. Looking at these headlines suggests that one thing has not changed: the lives of Emirati women are as full of opportunities as they are of contradictions and, to Western minds at least, restrictions. I would like to know more about the way people in the Arab Gulf region dress has changed over the years. What's your view? If you have a comment, please don't hesitate to chime in.